Monthly Installment Scheme Plots in Chennai – Manavur Plots for Sale @ Rs.299/- Per Sq.ft DTCP Approved Plots in EMI Scheme starts @ Rs.4000/- Monthly for 42 Months. Call: 9600043710. Our Manavur Layout exactly located 2 Km from Manavur Railway Station. 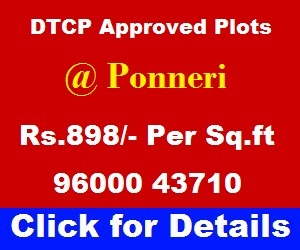 Our Manavur Plots is under CMDA Limit that is in Chennai City Limit. So we can always expect rapid growth. Tamilnadu Government recently releases order to expansion of area domain for CMDA upto Arakonam. Please see the below image for more information. Totally 1709 small village localities comes under this CMDA limit. It includes Kanchipuram, Thiruvallur and Arakonam under this Tamilnadu Government Scheme. Even though it looks like a small expansion in general but if you go through each and every District Headquarters separately then you’ll appreciate this major expansion. Because each districts have more than 100 villages in particular. So it is a vast development in this area. Sree Nikethan Matriculation Higher Secondary School, Etc. Vadaranyam College Of Education, Etc. Annai Saraswathi College Of Education, Etc. Below Board Placed by State Government near Our Manavur Site. If you pay HALF Amount within a week of Site Visit and Balance Pay in 3 Months then you will get Free Registration but you have to pay for Patta Separately. If you pay HALF amount within a week of site visit and balance in 11 months. Then you will get Free Registration but you have to pay for Individual Patta separately. EMI Scheme – Rs.340 Sq.ft / 600sqft – Rs.2,04,000/- / Agreement Amount – Rs.36,000/- / Monthly EMI – Rs.4000 X 42 Months. For 42 Months EMI Scheme Customer should bear Registration Charges and Individual Patta Charges. Please share this post with your friends and relatives and also tell this information to your friends. Thank you.